Just found out about a great product from BecauseITriedIt.com called "The Birthday Chronicle". 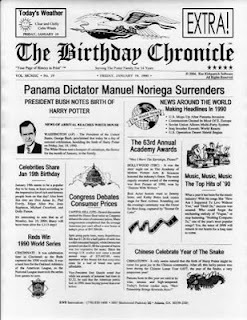 This is a personalized 8 1/2 x 11 mini-newspaper front page ~ you can get the birthday chronicle from Jan 1, 1990 thru Dec 31, 2011. 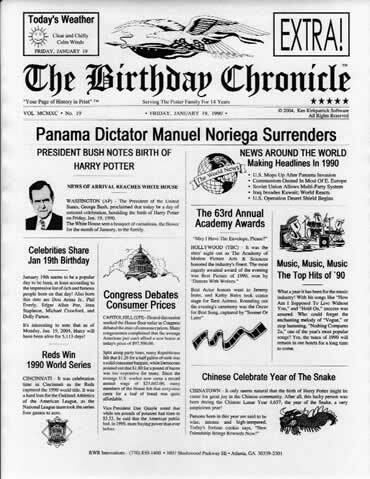 This Birthday Chronicle includes ... a greeting, by name, from the then President of the US, plus newspaper headlines and stories from the year of your birth! I received one for my daughter's birthday and it is such a great conversation piece and something for her to keep for years to come. I would like the The origin or meaning of your first name?.